Up in the attic, we take content curation seriously. We spend time organizing not only the questions in Problem-Attic, but also the reading passages and graphics. (The graphics library is described here.) If you’re an ELA teacher, this makes it much easier to find passages that tie in with your curriculum and are the right length and difficulty for lessons, homework and tests. Index – this has approximately 1800 passages organized by title, author, genre, grade, readability score, and number of corresponding questions in the Problem-Attic database. 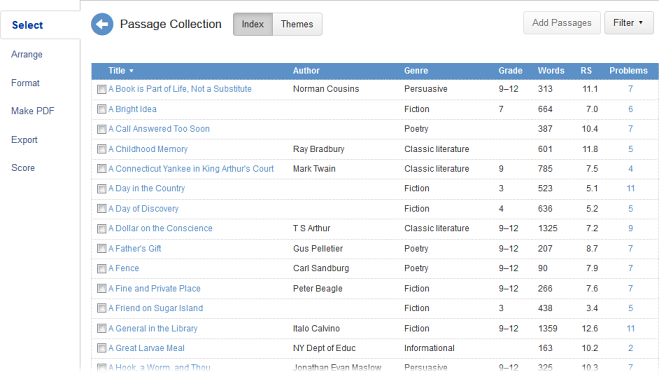 Themes – this shows about one-third of the indexed passages in a thematic or topical hierarchy. It gives you an alternative way of searching for passages and selecting them in small groups (often called “pairs” or “triplets”). Note: The reading collection is a subscriber option. To learn more about a school-wide subscription to Problem-Attic, click here. On the main Select page. You’ll see links to the Index and Themes in the bottom-right panel, which is called “Other Subjects”. Hint: If you have drilled down into the database, you can quickly get back to the main page by double-clicking Select. On the Arrange page. Click a Part and then click Details. You’ll see links to the Index and Themes below the directions box. The Index is sortable. To change the sort order, click or double-click one of the column headings. The Index has a Filter button, which lets you reduce the number of passages that are shown. 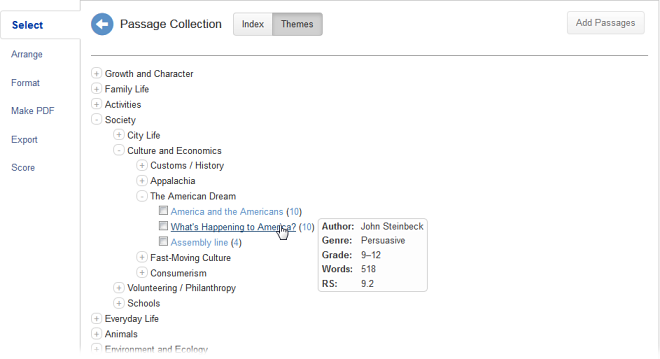 You can set the filter for a particular genre, grade range, word count, or reading score. It is not necessary to enter both low and high numbers. If you enter just one number, it will serve as a minimum or maximum. Please see the section below to learn more about grades and other passage “metadata”. If you have already divided your document into parts, you will be given the option to add passages to the currently selected part (on the Arrange page) or to create a new part. For more information about document parts, click here. The above technique for adding passages is most useful if you want to write your own questions. As an alternative, you can jump to the questions which already exist in the Problem-Attic database and which are associated with a passage. To do that, simply click the problem number which appears on the right column of the Index or next to the passage title on Themes. You will be taken to the selection page which shows the questions. Important: When you select questions that are associated with a passage, the passage itself is automatically added to your document. There is no reason to add it separately from the Index or Themes. If you add it before selecting questions, then you may get a repeat. In that case, go to Part > Details on the Arrange page and delete the extra passage. The term “passage metadata” refers to grade, word count, and readability score. For reasons given below, the metadata can be misleading. We’ve provided it mainly to give you some rough guidance when selecting passages. Please do not use it as the sole determinant of whether a passage is appropriate for your students or assume that it’s an accurate measure of their reading skills. Grade. The grade, when available, comes from the source document. For example, if the passage was originally part of a state assessment for grade 3, then that’s the grade we show in the Index. If it comes from a curriculum document that covers multiple grades, we usually show the whole range. Similarly, if it comes from a high school test, we show grades 9–12. Word Count. We calculate the word count after converting a reading passage to a plain text file. If it has complex formatting, or if it includes a diagram or table of data, then the word count may be a little different from what you see on a PDF. Also, there can be small variations due to footnotes, a copyright statement, picture captions, etc. For some passages, which are entirely graphical, we’re not able to calculate the word count, and it’s blank in the Index. Readability Score (RS). This number is an average of five common measures of grade-level appropriateness: Flesch Kincaid Grade Level, Gunning Fog Score, Coleman Liau Index, SMOG Index, and the Automated Readability Index. Like word count, a readability score can be thrown off by formatting, tables, diagrams, etc. Especially for poetry, the calculated score and the assigned grade may be quite different. Very important: “readability” is a descriptive, not a prescriptive, term. It does not tell us what students are supposed to be able to read at a certain grade. It tells us only if a passage is likely to be understandable. Moreover, the idea is not without controversy. Experts often say the most important determinant of readability is whether students are interested in what they are reading, or can relate to a passage through prior experience. Therefore, we suggest you use RS not as an absolute measure, but rather as a way to judge the relative complexity of passages.